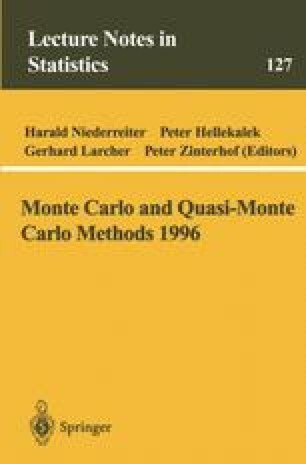 Lattice rules are quasi-Monte Carlo quadrature rules for multiple integrals defined on the s-dimensional cube [0,1)s that generalise the more widely-known method of good lattice points by allowing more than a single generating vector for the set of quadrature points. It is known that any s-dimensional lattice rule may be expressed as a multiple sum in terms of at most s generating vectors. The minimal number of generating vectors required in this form for a given rule is called its rank. A rank 1 rule which has a generator with at least one component that is a unit is called simple. A key problem in the application of lattice rules is the identification of rules of various ranks that perform well with respect to certain standard criteria, one of these being the ‘figure of merit’ ρ. Various strategies have been used in conducting computer searches for rules that perform well with respect to this criterion, and some ‘good’ (with respect to ρ) rules have been found as a result. However, for a variety of reasons, constructive approaches are also of interest. In recent work the author has investigated the connections between the theories of Diophantine approximation and lattice rules. It was shown that bounds on the figure of merit of a rank 1 simple rule with a given generating vector could be expressed in terms of parameters determined by the best simultaneous Diophantine approximations to an (s-1)-dimensional projection of the generating vector. These bounds were interpreted as indicating that generators for good rules might be constructed from rational vectors that are poorly approximated, in a particular sense, by rational vectors with lower denominators. In this paper these results are extended to higher-rank rules.